Royal Vegas Poker Is Giving Away A Seat To The $50,000 Buy-In WSOP 2006 H.O.R.S.E Tournament. 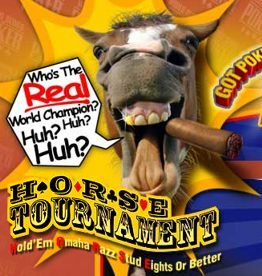 Royal Vegas Poker lets you in on the Blue Ribbon event of the year: WSOP 2006 H.O.R.S.E Tournament (Hold'em Omaha Razz Stud Eights or Better). Royal Vegas Poker's brand new promotion is sure to grab the attention of serious poker players. This new and exclusive Hold�Em event will see one lucky player hoofing it to the WSOP 2006. This brand new event will ultimately determine the true World Champion of poker. Royal Vegas Poker is giving away a seat to the world�s premier poker event - the brand new, 3 day, $50,000 buy-in, WSOP 2006 H.O.R.S.E Tournament. The event to be held at the Rio All-Suites Hotel and Casino, Las Vegas, on Tuesday, July 25th 2006. Plus, the winner will receive an additional $5,000 spending money from Royal Vegas Poker room! Players can enter the Royal Vegas Poker's "WSOP 2006 H.O.R.S.E Tournament" by playing Hold'Em, available now until June 25th, 2006. To make your dreams a reality, simply download and install Royal Vegas Poker software here. Once completed, register an account. You will be provided with your login name and password. Once you are registered as a Real Player, you can enter the Royal Vegas Poker, "WSOP 2006 H.O.R.S.E Tournament" by playing Hold�Em. In order to find the sit n go�s in the software simply go to the Sit N Go section and select the �Rounders� tab. Level A and Level B are Sit N Go tournaments which you can play anytime. The buy-in for Level A is $5 + $0.50. The buy-in for Level B is $50 + $5. All you need to do is register and wait for the table to fill up with 10 players to commence play. However if you wish to skip both Level A and Level B you can enter the Multi-Table Tournament for a buy-in of $500 + $50, which is taking place on Sunday June 25th at 9:00 p.m. EST. As a new player at Royal Vegas Poker you can claim $10 free, no deposit required, and extra 40% match bonus up to $40 free with your first purchase. To receive the bonus players should rake a number of raked hands equal to double the amount of the deposit (e.g. on a $100 deposit, player must play 200 raked hands) at tables with limits no lower than $0.25/$0.50.